What makes a great email campaign manager? Well, it depends on what you’re looking for. Some of us prefer the big, bold, audacious marketing platforms that allow us to run everything from one centralized hub like a villain from a James Bond movie. And other people prefer the littler guys: services like JangoMail. Providing quality email management services for a regular, predictable fee is just about all you want out of your email marketer, and JangoMail delivers by being upfront about its offerings and its pricing structure. And heck, after reviewing ExactTarget, that sounds like a prospect that’s downright refreshing. But in order to refresh properly, JangoMail’s got to deliver the goods – and deliver them at a reasonable price. Throughout thisJangoMail review, we’ll take a look at JangoMail’s features and stack them up together for an overall impression of an email marketing service that just might be exactly what you – and I – have been looking for. You can kind of tell how good an email marketing service will be by how upfront they are about their features. Yes, I’m very adamant about this principle, but it’s not a bad one. Are they vague about them, preferring to tell you instead of what benefits you’ll receive by signing up to their service? Or are their feature pages more like JangoMail’s, using the service’s own characteristics as a selling point? I obviously prefer the JangoMail approach because you know what you’re getting into before you even start. That’s good news if you don’t have a free trial opportunity – although JangoMail does, but more on that later. 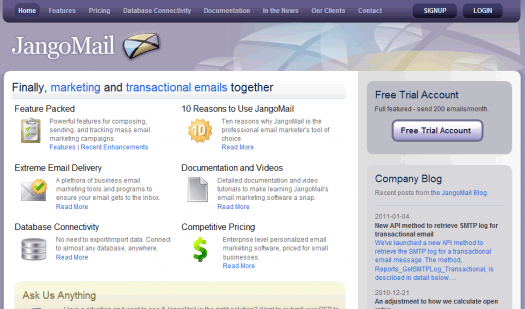 The list of features on JangoMail is impressive and rivals any of the bigger-name email platforms out there. Issues like transactional emails, HTML emails, analytics, email deliverability – it’s all there in plain English. Okay, so it’s not the most attractive editor ever – and the entire control panel kind of looks like that – but if it gets the job done, it gets the job done. With all of the features present in JangoMail’s offerings, it looks like that will be the case for a vast majority of email marketing customers out there. An email marketing service like JangoMail is really only superior to its competition, however, if it can deliver on two basic principles of product quality: overall functionality and price. Before we get into the price of JangoMail, let’s take a further look at the features and see if truly stacks up to the competition. JangoMail’s main attraction being its laundry list of features, that’s what this review is focusing on. 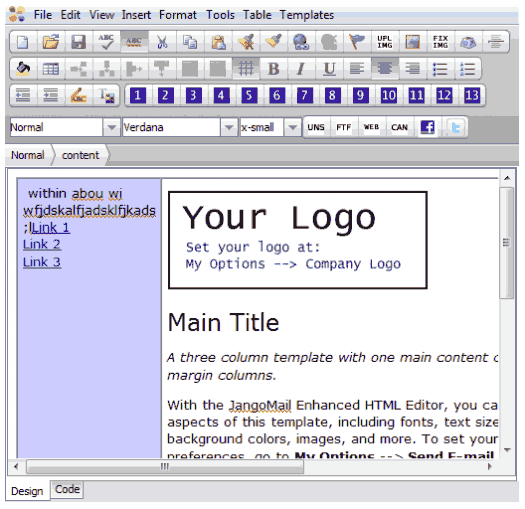 The simple fact is that JangoMail has all of the little nooks and crannies that you’d expect from a quality email manager. While JangoMail explains in its FAQ section that the reason to go with an email campaign manager rather than send out your own emails is that using a manager allows for features like avoiding spam folders and sending out emails to a lot of different people, there’s more to the story than that. Features like editing your “From” bar to easy HTML editing, or tracking campaign performance via analytics and building different sections of your list are all part of the standard “list” of services provided by most email managers. But it’s not a good email manager unless it provides the goods on all of these features. JangoMail does. Other features you’ll find include the usual – sign-up forms, automated responders, list scrubbers – to the slightly more obscure and technical – database connectivity and the API/web service. While not any one particular feature will jump out at you as shock-inducing, you’ll probably find that the overall result of all these features is that you’re comfortable you’ve purchased a product that can handle just about all of your demands. But lest this review of JangoMail crumble like a falling tower of Jenga, the pricing structure put in place really needs to hit the spot. First, the free trial offer provided by JangoMail is permanent, which puts it immediately in the upper echelon of email marketers with something free to give away. You know Clickfire.com loves free, and since JangoMail offers its services for free up to 200 emails – a number I haven’t yet seen – there’s clearly a bargain to be had here. As far as the paid pricing structure goes, there’s nothing really out of the ordinary in either a good or a bad way. Sending up to 1,000 emails will cost $15, and then $25 for up to 2,500 emails, all the way up to $3,200 for 616,000 emails. It’s the pricing structure we’ve all come to expect from an email marketing manager: it’s not pay as you go, it’s pay as you grow. I think many of us are fine with that. JangoMail is basically what I expected: a quality service stacked with features that offers a decent pricing plan. There’s really not much more to the equation than that, unless you count the stellar free trial account – something just about anyone starting off with email marketing will want to employ. Whether you’ll still like JangoMail after your list grows to 201 subscribers and you need to start paying will be your own affair, but for those first 200 subscriptions it’s reasonable to expect you’ll find yourself learning a lot about how email marketing works. That’s just how JangoMail puts it together: there are a lot of ways to explore your own strategies and tools, and there are enough of each that you shouldn’t get bored. JangoMail’s a great service for the beginner also because of simplicity and a bare-bones approach to the overall interface. You might move on to more sophisticated and stylish email marketing managers later, but for now, who cares? You’ve got JangoMail to work on.